Conifer offer a Shropshire wide service to our customers for whole house damp proofing Shrewsbury, damp proof coursing and chemical injection DPC work. Call us on 01743 818 055 to arrange a visit. At Conifer we provide damp proofing systems for property renovation, restoration and development. Conifer Property Services Ltd are a damp proofing company undertaking the installation of various waterproofing systems in and around Shropshire and Shrewsbury. 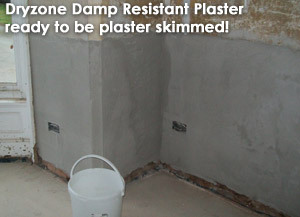 Our services include:- Damp proofing, basement conversion, specialist plastering - including Dryzone Damp Resistant Plaster (Heritage Approved), Oldroyd Cavity Drain Systems, Dryzone chemical injection, Dryrod DPC installation, Drybase Damp Proofing Membranes and Vandex tanking and slurry systems. We also have the general building skills necessary to offer a one-stop-shop service to complete your damp proofing or basement / cellar project. Conifer Property Services Ltd specialise in damp proofing to period properties built in stone or with solid-walled (no cavity) construction! 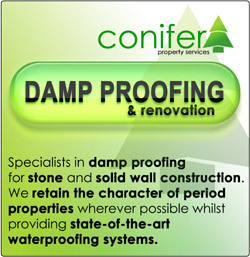 Conifer are dependable and experienced damp proofing installers working in the Shropshire area. Your project will be carried out professionally and to a high standard. To view further information on damp solutions please follow the navigation left, enter a search or visit our site map. You may also find a range of helpful articles and information within our blog: Please see "Dampnation" for more! For a free quote or advice call us on 01743 818 055 or freephone 0800 001 4213 or send us your enquiry via email and we will get back to you as soon as possible! Conifer, Damp Proofing Shrewsbury and Shropshire.